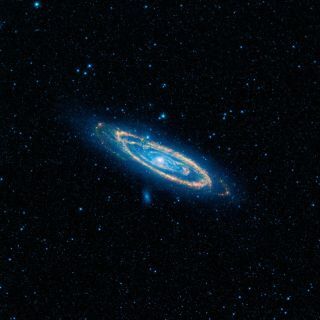 A false-color image of the mid-infrared emission from the Great Galaxy in Andromeda, as seen by Nasa's WISE space telescope. A wide-ranging search of faraway galaxies has turned up no obvious signs of advanced alien civilizations. A team of scientists dug through observations made by NASA's Wide-field Infrared Survey Explorer (WISE) spacecraft, hunting for telltale heat signatures coming from 100,000 galaxies— a strategy suggested by theoretical physicist Freeman Dyson back in the 1960s. The team found no smoking guns during this pilot study, known as the Glimpsing Heat from Alien Technologies Survey (G-HAT). "Our results mean that, out of the 100,000 galaxies that WISE could see in sufficient detail, none of them is widely populated by an alien civilization using most of the starlight in its galaxy for its own purposes," Wright said in the statement. A false-color image of the mid-infrared nebula surrounding the nearby star 48 Librae. That's not to say the G-HAT team found nothing interesting, intriguing or odd in their hunt for heat signatures. Indeed, about 50 of the galaxies had unusually high levels of midinfrared radiation. Follow-up studies could help determine if this heat is being generated by natural processes, or if it could be a sign of intelligent aliens, the researchers said. The new study was published last month in The Astrophysical Journal Supplement Series. The WISE spacecraft launched in December 2009 and scanned the entire sky in infrared light twice before being placed in hibernation in 2011. The observatory was reactivated in 2013 to hunt for comets and asteroids that could pose a danger to Earth.